I love surprises, but I am rarely surprised. Really. Nothin’ gets past Shibow…usually. So when it happens, I tend to really react. Last weekend, Sylvapotamus surprised me with a friends-and-cousins-filled surprise party that was stuffed with pizza, cake and, uh, eventually, whiskey. And then, Pommes Frites. And then, a place called Winners Bar. Maybe that’s all I need to say to convince you all that it was a really fabulous surprise. Thanks to everyone who lied to me about it…you are all excellent human beings. In addition to that amazing day and night, I received some seriously sweet birthday presents from my lovely friends Atrish, Sofia and Dhanwanti, including a Betty Crocker cookbook, a set of baking pans, AND…. 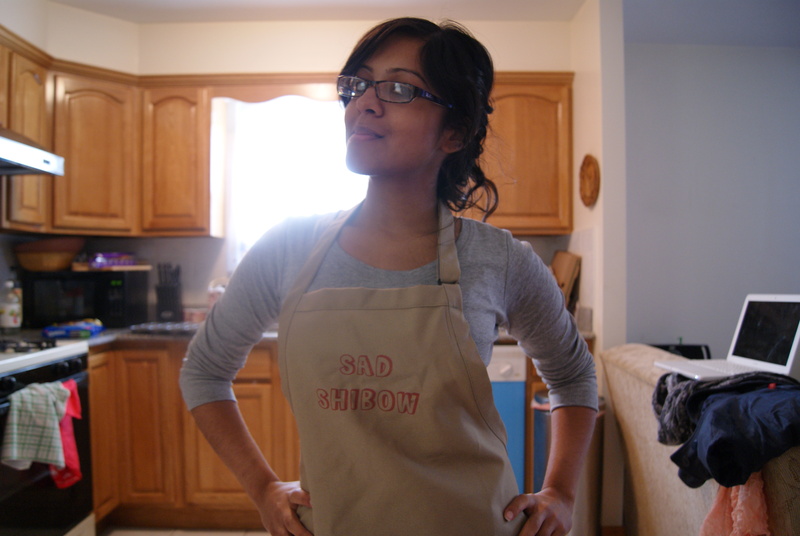 My new Sad Shibow apron! Yes, I did tear up a little upon receiving this lovely present in the mail. The combination of receiving a gift, receiving it in the mail and having it be one that’s so personal really touched me. And it’s always a surprise to learn that other people actually read and like this blog, even if those people are people that I love. Thank you, you three beautiful ladies. While I’m at it, thank you to everyone who reads and likes/does not hate this blog. Let’s be friends forever. Was that too gooey and mushy for you guys? Maybe I’m getting sentimental in my old age. Plus it’s been kind of a confusing and hazy week that I guess contributed to me reflecting on all of the awesome in my life. And there’s a lot of awesome. Did you see that apron? Awesomesauce. So, if you’ve clicked over to the original link (By the way, is “Foodbeast” not an amazing blog name? ), you’ll notice that I’ve halved the recipe. This is for two reasons: 1. People still think it’s my birthday and won’t stop feeding me, and 2. I live alone and can’t find anyone to eat 30 of these right now. But these idle hands need to create, so let’s do this. 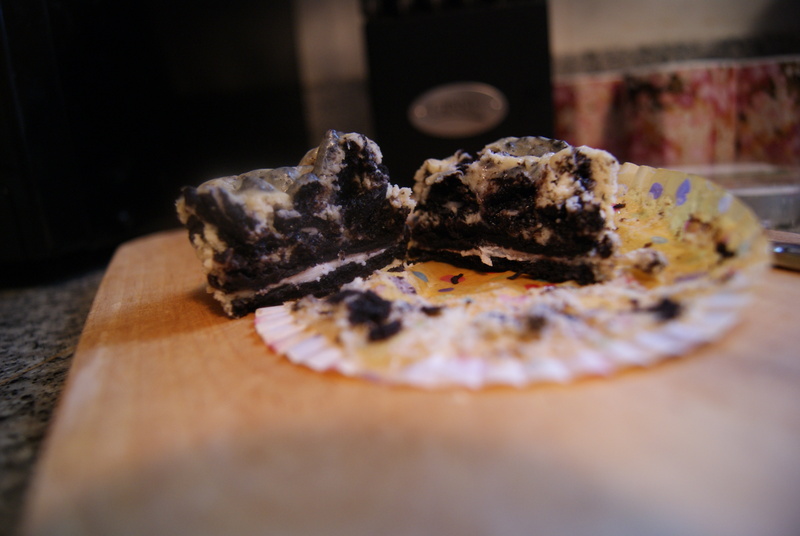 Chopped Oreos: As with most things in life, these were incredibly messy, annoying, and WORTH IT. Preheat the oven to 275°F. 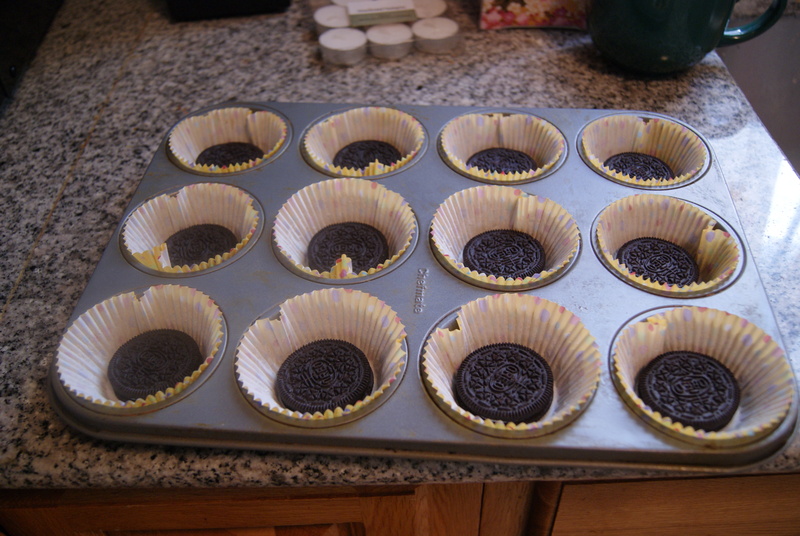 Line a muffin tin with liners and place one whole Oreo at the bottom of each. In a large bowl, beat the cream cheese with a hand mixer until fully whipped. Gradually mix in the sugar, scraping the sides of the bowl that are certainly splattered with cheesy, sugary goodness (Yay, aprons!) then add the vanilla. Next, beat in the eggs, one at a time, before finally mixing in the sour cream and salt. Stir in the chopped cookies, and pour the mixture into your mouth evenly into each muffin tin. Bake for 22-25 minutes (mine took a bit longer), until the sides look set and the center still jiggles a bit when you gently shake the pan. If you’re not gentle, you will burn yourself. It will be worth it, but you will burn yourself. Trust. Cool on a rack for about 10 minutes, then send into the refrigerator for about 4 hours to cool completely. So, as you can see, I went a little overboard with the chopped Oreos. 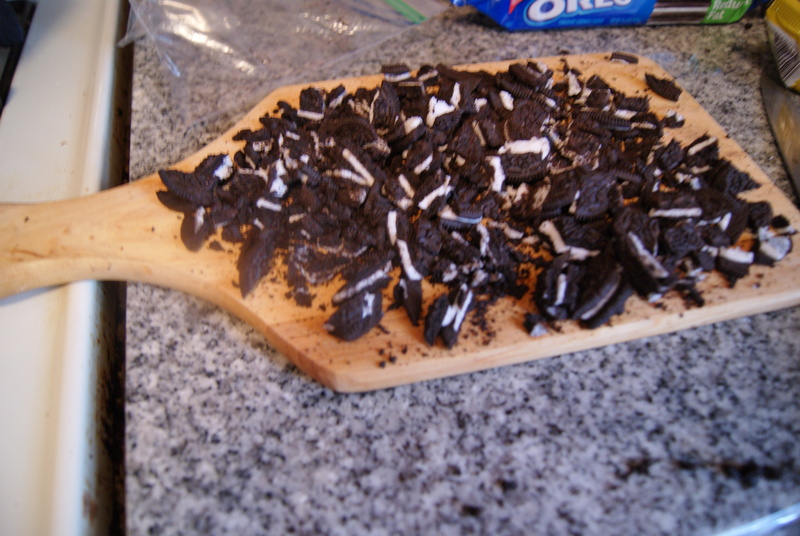 I probably used closer to ten cookies, and while I’m a huge fan of all things Oreo, I’d recommend chopping no more than 6 for a dozen mini cheesecakes, if you really want to get a proper Oreo-to-cheesecake ratio. Obviously I was still pretty happy with where I went with these, and I think you will be too. ← For My 25th Birthday, I’d Really Like My Voice Back. And Maybe Some Cake. Actually I’d Settle For Just Cake.